Munin is a Swedish nanosatellite meant to demonstrate the feasibility of using such tiny spacecraft – Munin's mass is a mere 5 kilograms – for on-orbit research; it is named after one of the God Odin's ravens. Munin collects data on the auroral activity in both the northern and southern hemispheres, enabling a global picture of the current state of activity to be placed on-line. Data acquired by the satellite then serves as input to the prediction of space weather. Munin images auroras with a miniature CCD (charge-coupled device) camera and measures high energy particles with a solid state detector. 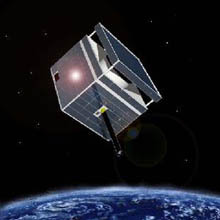 It was launched as a secondary payload together with NASA's remote sensing satellite EO-1 and the Argentinean satellite SAC-C.